Marble Temple in Bangkok's real name is Wat Benchamabopit and located at Si Ayutthaya Rd between Chitraladapalace and the Parliament building. if you come here in the month of June, you can be lucky enough to be part of a inauguration of the monks. If you are really quiet, you can be part of the whole mass. 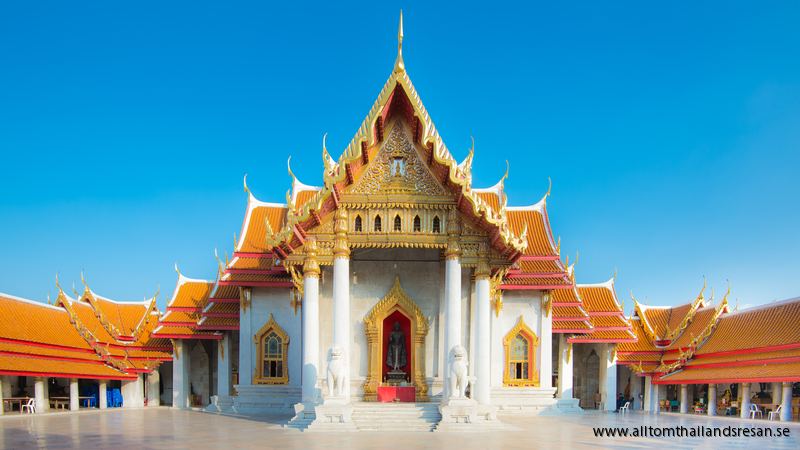 The temple is the newest of the royal temples in Bangkok, built by Rama V in 1899, with a name that logically means "the fifth king's temple." 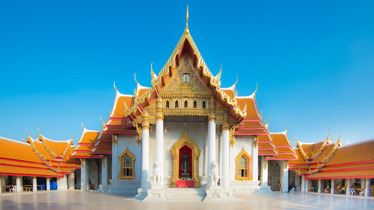 The king wanted the temple to be a perfect example of traditional Thai architecture and artisans got very strict instructions. However, there are certain differences compared to the traditional style. Most striking are the walls that are lined with Italian carramarble, the enclosed courtyard and the curved golden Chinese bricks that were used for the roof. The entrance is guarded by two large marble Singher. Inside is a copy of "Phra Buddha Chinarat" The original is in Wat Mahat in Phitsanoluk north of Bangkok and is dated to the 1300s. (The late Sukhothai period)The ashes of Rama V is kept in the Buddha's foundation. The colonnade around the place is about 50 Buddha figures in various styles and with different attitudes. Originally, it was Rama V's idea to place the country's finest specimens of cast bronze Buddha figures here in the hallway. But since they could not move all they made reproductions of them. This statue collection shows development in the Thai religious art. In addition to the copies of the Thai Buddha statues are replicas of famous Burmese and Japanese characters. Signs on the characters' sockets tell about it are reproductions or original figures and from which time and place. On the other side stands a Bodhi tree. According to what is said, it is a plant from a tree in southern Thailand, which in its turn is a plant from the tree under which Buddha was reborn in India. The tree is over 80 years old. Secluded from the other buildings is the monks' quarters. In this monastery, moreover, the current king been a monk. in the canals along the temple live turtles.